The AFp-424S type current collector belongs to the product group of AFp 121, 221, 321, 224 type collectors and these models are used for decades at many traction vehicles of the Hungarian State Railways (MÁV). 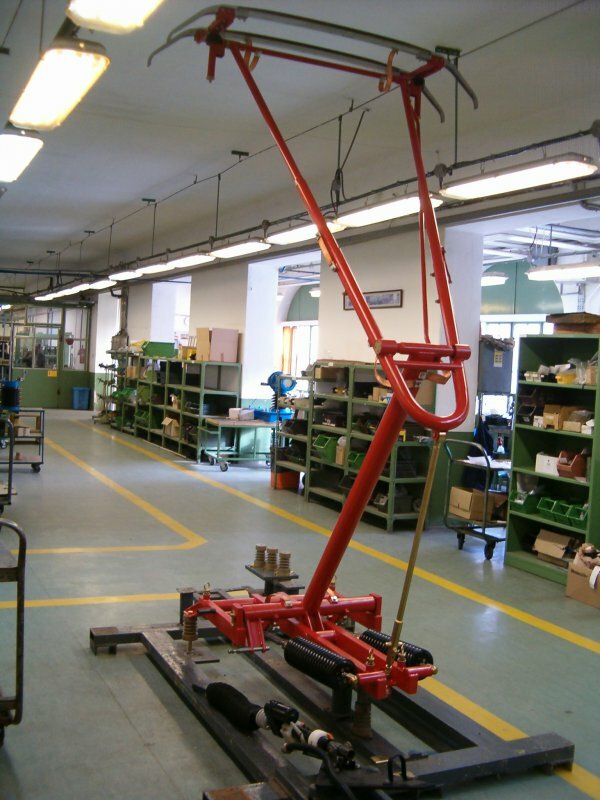 All dimensions and technical specifications have been ndesigned according to the standards of MSZ EN 50206-1. The profile of the sliding contact fits to the standards of UIC 608. The length of the interchangeable carbon shoe is 1150 mm and it can be used under the overhead system with sinuous ways between ± 300 mm or ± 400 mm. The collector can be operated by air spring which is driven by electro-pneumatic valves and regulators - and all the movement is operated by microcontroller. The constancy of nominal static force in the operating range of the device is set directly by a highly accurate regulator valve. The collector is set with an automatic pull-down mechanism (A.D.D.) and a force-limiting device into both directions. The same time/pressure program is loaded during these three phases: the normal pull-down movement, the A.D.D. and the force-limiting task. Lifting up is also controlled by a software and the movement can be performed smoothly onto any overhead system in any height. Nominal static force can be adjusted by switches - according to the abraison of the coal parts or the winter weather. After any replacements of spare parts the device can be easily adjusted. According to UIC 505, UIC 605, UIC 606, UIC 608, MSZ EN 50206 standard. Cégünk az áramszedő gyártásán túl javítását és alkatrészeinek utángyártását is vállalja.